If you are looking for Busselton Accommodation, Mandalay Holiday Resort & Tourist Park, situated between Busselton and Dunsborough in the Margaret River region, Western Australia, is your perfect destination. It is a unique beach resort with high quality, self-contained accommodation. If you are after a Busselton Caravan Park, Busselton Camping or chalet or cabin accommodation, look no further. We have two-bedroom and three-bedroom accommodation. As well as powered caravan and camping sites with 4.5-star resort facilities. Holidays with kids made easy with two bedrooms, sleeping up to six people (one king size bed, two single beds & one set of bunk beds) our villas are air conditioned, complete with a luxury bathroom with corner spa & laundry down stairs. Big Busselton Family accommodation at it’s best with a queen bed and four single beds, everyone can stay comfortably in our THREE BEDROOM SUPERIOR CHALET. It’s ideal if you are planning to invite visitors on your holiday. With no permanent residents we offer a unique holiday experience, enjoy pools, water slide, playgrounds, jumping pillow, WiFi & barbecues. The Private Ensuite Sites are 7.0m x 4.5m level shade cloth sites, all complete with water, sullage and power and accommodating groups of up to six people. With a spacious open-plan air-conditioned living area, complete kitchen including dishwasher, laundry, dining and lounge room with LCD TV, DVD & CD player, you will find all the comforts of home and more in these chalets. With a queen bed and single beds, it sleeps up to four people with maximum comfort and the corner spa bath means ultimate wind down time on your holiday! Some chalets sleep 5 people. When looking for chalets in Busselton you will find our larger, fully-equipped TWO BEDROOM SUPERIOR CHALET very spacious, air conditioned and comfortable; complete with a kitchen including dishwasher, lounge with LCD TV, DVD & CD player, dining and laundry. One queen size bed & two single beds. Take a virtual tour through our resort in Busselton plus experience Busselton camping first-hand. 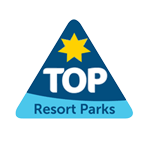 Click on the Resort Map icon to give you options on which part of the Holiday Park in Busselton you would like to tour.